Votelink.com discussion and voting tools puts powerful decision-making tools in your hands to help you make better decisions on any HOT issue. Using discussions linked to questions, our civic engagement system helps your city, organization business or group dissolve conflict, move toward consensus, and resolution on hot issues. For hard-to-reach citizens, use computer stations staffed by volunteers or paid scribes. Each question is linked to an online discussion. 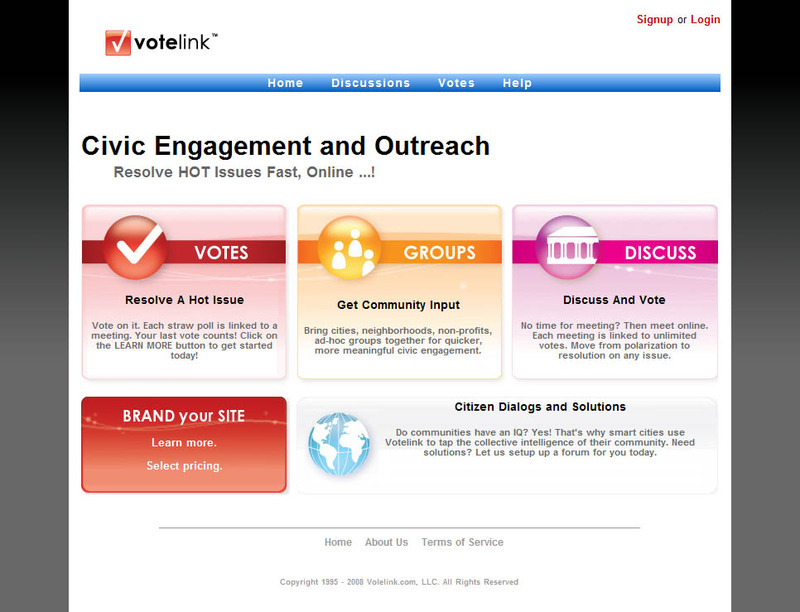 Votelink.com offers a low-cost online civic engagement system that is designed to reach 100% of the residents of any community, members of an organization, or special interest stakeholders. To get started, select a brand name. Then set up unlimited discussions linked to straw polls on those hot issues that matter most to you. Each question is linked to a discussion; & discussions include straw polls. Each person gets a single vote which can change, as they move from polarization to resolution. Use it to conduct very local meetings about issues that matter most to you. Our state-of-the-art decision-making tools in your hands to help you make better decisions on issues. Use our meetings linked to votes to help your city, group, business or organization dissolve conflict, & move toward consensus, and reach resolution on any hot issue. Cities and Neighborhoods— to tap the wisdom of the community on any hot issue; manage public input, and control hate mail. All too often, a small group of stakeholders (who may not represent the community at large) can dominate a meeting and slow down decision-making. County and Regional Planning — Most members of the public don’t have time to attend meetings. Unless paid to be there, they are too busy with their lives. Travel time, the high cost of gasoline, lack of public transportation, the need for a babysitter, travel away from home, or poor weather conditions can also limit public input and attendance. Energy use and the problems associated with America’s dependence on foreign oil can not be tackled by any one individual or entity. These challenges can only be addressed when citizens, businesses, cities, colleges & universities, and non-profits work together. ASK about our 30-day Energy Futures Project. We invite participants from your city – or college campus - to act “as if” they had only one-year to make a rapid transition to renewable energy and energy conservation. The goal: To get the whole community behind the effort to rapidly reduce energy consumption and use. Do communities have an IQ, or intelligence? Can some communities be thought of as smart, vibrant and engaging, like a child who excels at everything, while others are seen as slow to change, perhaps backward, or fearful? Can communities be measured and ranked according to their IQ? If so, which communities would rank as the top 100 smartest in the world? Which would be #1? Researchers, of course, can rank the top 100 cities in the U.S. in terms of their population, median age, price of housing, number of college educated residents, the fastest growing, or those with the highest median household income. But can they tell us which has the highest community IQ? Which city or town has the highest collective wisdom? How open is the community to new ideas and creativity? How many ways can residents engage in civic life? How close to NOW can citizens engage? Does everyone have a chance to both lead and follow? Speak and be heard? How quickly are best ideas integrated into action?